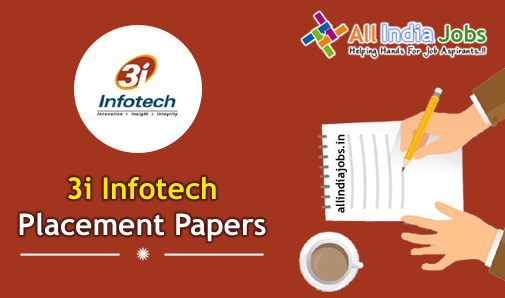 3i Infotech Placement Papers PDF Download 2017-2018| Aptitude, Reasoning & Verbal Ability Model Papers. Aspirants who are interested to get placed in the 3i Infotech company must read this article clearly. Aspirants who had a passion to work with 3i Infotech company must practice the 3i Infotech Placement Papers by using the syllabus and model papers provided in this article. Candidates must practice for the recruitment process to crack the 3i Infotech written test and interview process in an easy manner, job aspirants have to prepare well by using the below given 3i Infotech Sample Papers and Test Patterns of 3i Infotech Company. In this article, we have provided latest 3i Infotech placement papers which have been collected from various sources. Applicants have to prepare 3i Infotech Placement Papers and 3i Infotech Model Papers to excel the exam. Before starting your preparation always check the current job openings, Syllabus and also Test Pattern of a particular company. To guide the contenders we provided some Aptitude, Reasoning and English Test Papers Questions and Answers along with solutions. With the help of these practice test papers, aspirants can get an idea of the exam and can perform well in the 3i Infotech Recruitment Process. This is the right place for the applicants to gather all the useful information at the time of practicing for all Top IT Companies Recruitment. For every year, there is a heavy competition for career opportunities. Contenders who had the wish to work in 3i Infotech must utilize this excellent opportunity and can enhance their career. For the sake of the aspirants, we have uploaded 3i Infotech Placement Papers in form of PDF format. You can download them for offline preparation. To know latest updates regarding 3i Infotech Placement Papers bookmark our page All India Jobs. In this below article, we have provided the 3i Infotech Aptitude Questions And Answers along with a detailed solution. Aspirants can practice these Practice test questions to get the best result in the 3i Infotech written test. Distance covered in 2/60 hr = (1+1/2) km = 3/2 km. Distance covered in 1 hr = (3/2 × 60/2) km = 45 km. 3. A can run 224 metre in 28 seconds and B in 32 seconds. By what distance A beat B? 1st part = 782 * 6/23 = Rs. 204. 5. Simple interest on Rs.500 for 4 years at 6.25 % per annum is equal to the simple interest on Rs. 400 at 5 % per annum for a certain period of time. The period of time is? 6. 1296 ÷ (24 * 0.75) = ? 7. Two cities A and B 360 km apart. A car goes from A to B with a speed of 40km/h and returns to A with a speed of 60 km/h. What is the average speed of the car? 8. Sakshi can do a piece of work in 20 days. Tanya is 25% more efficient than Sakshi. The number of days taken by Tanya to do the same piece of work is? 5:4 :: 20:x => x= 16 days. New radius = 1/3 r.
11. A family consists of two grandparents, two parents and three grandchildren. The average age of the grandparents is 67 years, that of the parents is 35 years and that of the grandchildren is 6 years. What is the average age of the family? Man’s rate in still water = (15 – 2.5) km/hr = 12.5 km/hr. Man’s rate against the current = (12.5 – 2.5) km/hr = 10 km/hr. 14. The ratio of the length and breadth of a plot is 4 : 3. If the breadth is 40 m less than the length, What is the perimeter of the plot? Candidates who are preparing for the 3i Infotech recruitment, here on this page they can practice the below reasoning test questions and answers to get placed in the 3i Infotech recruitment process. In this simple addition series, each number is 5 greater than the previous number. Mallon piml means blue light ———– (I) Mallon tifl means blueberry ———– (II) Arpantifl means raspberry ———– (III) From (I) and (II) Mallon means blue Piml means light Tifl means berry From (II) and (III) Arpan means “rasp” in raspberry. The word piml, which means light. That rules out choices a and c. Arpan in choice b means “rasp”, so that rules out choice d. That leaves choice (b) the only possible answer. 4. How many pages of the book X did Robert read on Sunday? I. The book has 300 pages out of which two-third were read by him before Sunday. II. Robert read the last 40 pages of the book on the morning of Monday. 6. How many 6’s are there in the following number sequence which are immediately preceded by 9 but not immediately followed by 4 ? 7. Assertion (A) : Increase in carbon dioxide would melt polar ice. 8. In the series 3, 9, 15, …… what will be the 21st term? Clearly, 3 + 6 = 9, 9 + 6 = 15,….. Therefore 21st term = a + (21 – 1) d = a + 20d = 3 + 20 x 6 = 123. 10. Life : Death :: Hope : ? The words in each pair are antonyms of each other. 12. Pointing to Gopi, Nalni says, “I am the daughter of the only son of his grandfather.” How Nalni is related to Gopi? Nalni is the daughter of the only son of Gopi’s grandfather. Hence, it’s clear that Nalni is the sister of Gopi. The letters move 5, 4, 3, . . . steps backward. Fact 2. Two of the children have blue eyes and two of the children have brown eyes. Fact 3. Half of the children are girls. Since one-half of the four children are girls, two must be boys. It is not clear which children have blue or brown eyes. 15. Statement: All existing inequalities can be reduced, if not utterly eradicated, by action of governments or by revolutionary change of government. I. Inequality is a man-made phenomenon. II. No person would voluntarily part with what he possesses. We had given the English test questions and answers with a brief explanation in the below section. Contenders can practice these questions before going to attend the online written test of 3i Infotech. 1. Let him take the oath. A. Let the oath be taken by him. B. He has to take the oath. C. The oath needs to be taken by him. D. Tell him to take the oath. Let the oath be taken by him. 2. King Francis was a hearty king and loved a royal sport. 4. Someone call __________ police! 7. The fuel tank of a car can contain ______ petrol. All except Spider are insects having six legs. 9. Those who are sympathetic _____ that candidate have been asked to give active support to him. C. is that he avoids to speak to me. Dear readers, the Aptitude, Reasoning and English practice tests along with a 3i Infotech placement papers provided here are just for reference purpose only. So Please check official company website for the latest syllabus and all IT Companies recruitment information. Applicants can bookmark our website allindiajobs.in for regular job updates.